St. Monica Parish will assist you in preparing to live the sacramental marriage vocation. Marriage is central to the meaning of the Church. You are beginning a new call in the Body of Christ through your commitment in Christian Marriage. Our program of premarital preparation is designed to give you the best in guidance and support. 1a. If you are already civilly married, meet with the pastor (359-2700). 1b. If you are not married, meet with the pastor (359-2700) at least six months before you would like to get married. He will gather initial information and guide you to the next step. You are required to take a marriage inventory and attend one of the following: a Pre-Cana or Engagement Encounter at the Catholic Pastoral Center or attend several meetings with a trained married couple from the parish. 2. Confirm the date for your wedding with Fr. Hamilton at 359-2700 to determine his availability. Normally, the pastor witnesses marriages during Mass and a deacon witnesses marriages outside of Mass. Should you have a friend who is a priest or deacon, he is certainly welcome to preside at your wedding, provided he has the necessary permission and delegation from St. Monica's pastor. 3. Confirm the date with the Parish Office (359-2700) to assure church availability. 4. Contact one of the music directors to assure their availability (Marie Connolly: 341-4889 or Melani Roewe: 282-3140). The rehearsal will usually take place the afternoon or evening before the wedding and all people taking an active part in the ceremony should attend. Obtain a new (issued within six months of your wedding) Baptismal Certificate from the parish where you were baptized—not an old family copy, but a new one issued just for your marriage. Once you are married, a notice will be sent to your church of baptism. They will make entry into your Baptismal Register there and a notation of your marriage will appear on all subsequently issued copies of your Baptismal Certificate. Jesus teaches that a valid marriage can only be ended by death, so if one of you has a previous marriage and a still-living former spouse, you will need to show that your previous attempt at marriage was invalid, lacked something necessary for validity. The process of doing this is called seeking an annulment of that marriage. If one of you has a previous marriage that ended in divorce, you should discuss this with the priest/deacon at your very first meeting. 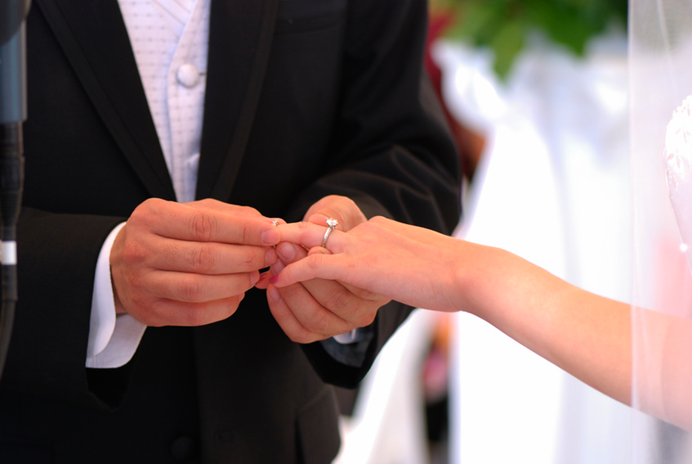 Annulments take time and you cannot be married in the Church until any needed annulments are obtained and finalized. Marriage License Office: (405) 713-2311, located downtown in the Oklahoma County Courthouse, 4th Floor. Your marriage license must not be attained more than 10 days before the wedding date. The marriage license is valid only 10 days after it is issued. Cost is $50.00: cash or check, only. It's only $5.00 if you present a letter stating that you went through the archdiocesan preparation program. Request your letter from the priest or deacon who worked with you at St. Monica. Bring the letter with you when you go to get your license. If paying by check, the check must be from a local metro area bank. Out of area checks are not accepted by the marriage license office. Credit cards are not accepted. When applying for the marriage license, both the bride and groom must be present. Each must present a valid Oklahoma driver's license or other state issued photo identification. Each must be at least 18 years old at time of application.